Vincent brings significant tennis experience to the program with over 15 years of teaching and coaching. Vincent is a USPTA Certified Elite Tennis Professional, a former UCLA All-American and professional ATP player. He was a top 10 junior in France, before being recruited by the No. 1-ranked University of California at Los Angeles (UCLA) tennis team. During his senior year, he was ranked in the top 4 NCAA Division I. Vincent graduated in 1998 with a degree in Economics. Upon graduation, he played on the professional circuit (ATP Tour) at the Grand Prix level including worldwide top players such as Sampras, Agassi, Ferrero, Federer, Hewitt and Roddick. He retired from the professional tour in 2001 at the Mercedes Benz Cup Tournament in Los Angeles. Notable wins over Vincent’s tennis career were Mike Brian (ranked career high #1 in the world in doubles), Nikolay Davydenko (ranked as high as #3 in singles), Jonathan Erlich (ranked as high as #5 in doubles), Thomas Johansson (ranked as high as #7 in singles) and Hicham Arazi (ranked career high of #22 in singles). Vincent was also a hitting partner for Natalie Tauziat (ranked as high as #3 in the world), Peng Shuai (ranked as high as #1 in the world in doubles); and Mary Pierce (ranked as high as #3 in the world) during her first Grand Slam win in Paris in 2000. He then acquired some coaching experience on the Women’s Tennis Association (WTA) tour with local players. 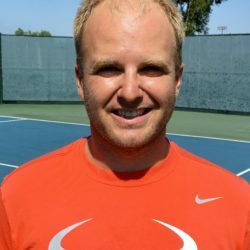 He has been teaching and coaching junior, college and professional players all over Orange County for 15 years, and he is very excited and enthusiastic to bring and develop his tennis program in Aliso Viejo. Paul brings 30 years of coaching experience and holds 3 professional certifications (USPTR, USPTA, CPT). 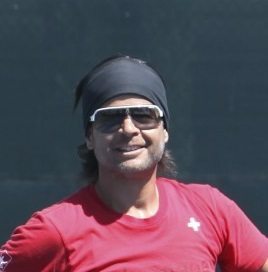 He has worked with renowned coaches and mentors such as Dennis Van Der Meer of the Van Der Meer Tennis Academy, Joseph Lizardo (Former Davis Cup Coach) of the Lizardo Tennis Academy and Ivan Lendl of the prestigious Grand Slam Tennis Academy in New York. Paul has headed the development of nationally ranked juniors, amateur and ATP tour players. 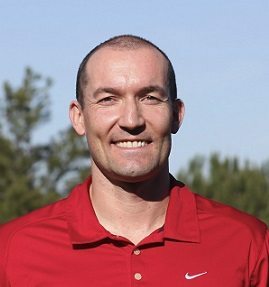 In addition to his tennis experience, Paul is a certified athletic development coach with a specialization in sports-specific training for tennis athletes. He has also worked with professional and Olympic sport athletes at Redline Athletics. Paul was a top junior in South Carolina and has competed in ATP 1000 tournaments. He currently trains top junior players in Southern California. He is also the Founder and Director of ServeUp Tennis and specializes in tracking, measuring and improving swing performance through visual analytics. He is very excited to be a part of the French Junior Tennis program and sharing his knowledge of the game. 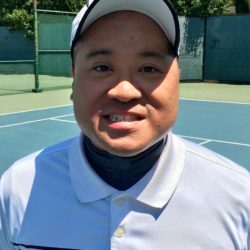 Eric Truong has been working as a tennis instructor for 8 years for the City of Irvine, CA. He has a PTR certification for ages 10 and under and he is currently working with youth ages 5-16, several who have autism and other learning disabilities. Eric have played competitively in World Team Tennis and USTA Leagues. In both leagues he was captain and helped direct his team to finals. Eric won first place at both the Hank Lloyd’s Orange County Team tournament and the Long Beach, CA Billy Jean King Round Robin competition. Coach Eric has a deep passion for teaching children, and feels the one to one relationship he builds with each child is as important as the technical skills that he helps them develop their game. John is a USPTA Certified, and he started playing tennis when he was 5 years old. He also played soccer, baseball, basketball and football until age 13 when he focused mainly on tennis. He attended tennis camp every summer from age 8 and also attended various prestigious tennis camps and Bollettieri Tennis Academy. He played varsity high school all 4 years, was #1 singles, all-league, all-County, and MVP 3 years. He also won numerous USTA tournaments (14s, 16s and 18s). He was recruited by several D- I, II, and III colleges, but elected to play Club Tennis at University of Arizona during his undergraduate studies and also at Cal State Fullerton. He was the junior varsity tennis coach for both boys and girls at his high school prior to relocating from New York to California. He has been coaching in the OC for the past 3 years, teaching children and adults in groups as well as private lessons. He continues to play in USTA tournaments as his schedule allows. Arya has 20 years experience of playing and 10 years of teaching tennis. He has been a member of Iranian Junior Davis Cup Team for consecutive years. Arya has earned more than 10 single and 4 double titles both domestically and around Asia. 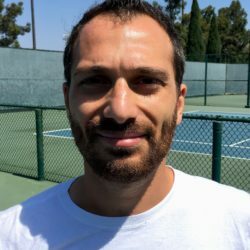 Since he moved to Califnonia in 2011, Arya has continued to teach tennis in different places. For a year and half, he was an instructor at Dent Tennis Academy at Newport Beach, California, where he instructed different tennis clinics, under 10, under 16, senior, under the supervision of former professional tennis players, Taylor and Phil Dent. 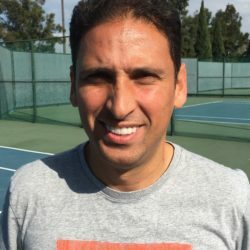 In Claremont California, as a PhD student at Claremont Graduate University, Arya has taught tennis for more than 7 years at Pomona/Pitzer Tennis Club. He has also played some USTA tournemants and currently has a 5.0 rating. Arya loves teaching tennis. He is a very patient teacher and makes a good bond especially with junior players. As your tennis instructor, he will help you find your optimum way of playing the game. Ali is USPTA certified and has 3 years of teaching experience with children and adults. He started coaching tennis in Dubai and after moving to California, he joined the Johnny Allen Tennis Academy. Ali is passionate about tennis and his mission is to transfer his passion to his students.